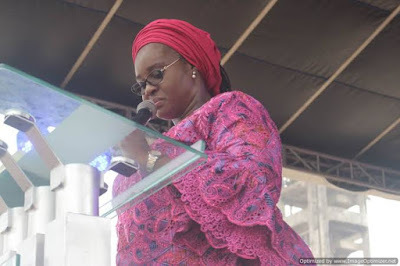 Following the exclusive story published by this medium last week about fake empowerment programme organized by Kwara State First Lady, Deaconess Omolewa Ahmed in March 2018, more beneficiaries have contacted our correspondent to reveal how the first lady played on intelligence of thousands young women that attended the 2018 International Women Day held at Banquet Hall, Ilorin. The selected beneficiaries said Mrs Omolewa Ahmed is yet to provide fund for 20 young women that indicated interest in agriculture. They disclosed that the first lady pledge to facilitate land and start up fund for intending Agricpreneurs. Our correspondent gathered that the office of the first lady is yet to reach out to them after 10months. Recall that this medium reported that Deaconess Omolewa Ahmed fails to release SME loan to 50 beneficiaries as promised. This medium is currently investigating, if Kwara Governor's wife has given scholarship to 20 people at IVTEC as promised in the event. As at the time of filing this report, the first lady has not debunk or confirm the claim of beneficiaries of the empowerment programme.